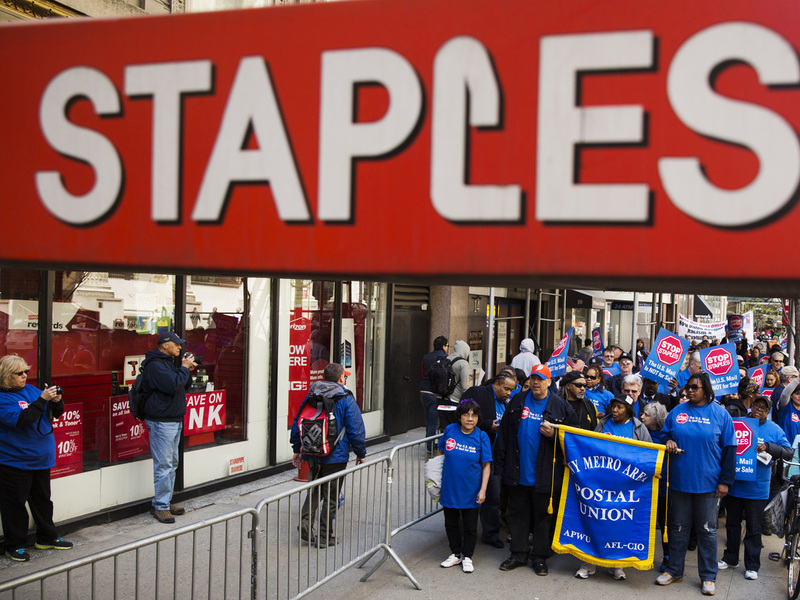 NEW YORK - Postal workers are protesting the opening of postal counters in Staples (SPLS) stores that are staffed with retail employees. Thursday's protests are planned at 50 locations in 27 states, including rallies in New York, Los Angeles and Washington, D.C. In Washington, more than 200 people gathered at a Staples, drumming on buckets and holding signs that read: "Stop Staples. The US Mail is Not for Sale." Last year, Framingham, Mass.-based Staples Inc. began offering postal services under a pilot program that now includes some 80 stores. The American Postal Workers Union objects, because they say well-paid union workers have been replaced by low-wage nonunion workers. The union says that could lead to layoffs and post office closings. Postmaster General Patrick Donahoe says the program is a response to customer demands for convenience.